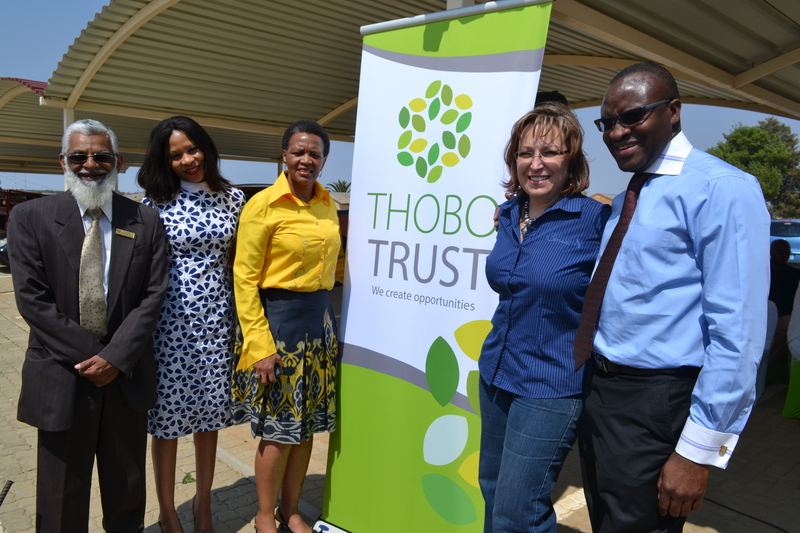 In conjunction with the launch was also the opening of the Thobo Trust Letsopa Computer Centre at the school which is situated in Ottosdal. Dolly Dlavane, chairperson of the board of trustees, and the District Director of education in the DR Kenneth Kaunda district in North West, Hasimbhay Motara, opened the centre, as well as other Thobo Trust board members, Elmarie Joynt, Kholofelo Thobejane and Joe Maswanganyi. It was indeed a festive affair with 200 learners, representatives of the four primary schools namely Letsopa, Naledi, Lebogang and Tumisang Primary Schools in Letsopa, Ottosdal, principals, SGB’s as well as parents being part of this auspicious occasion. The centre comprises 12 brand new computers and 8 refurbished ones that are connected to a printer. The four primary schools in the area will benefit from the centre as they have an agreement to share usage thereof. Each school will have at least one day a week to use the centre. The other three schools are Naledi, Lebogang and Tumisang Primary Schools that are all within two kilometres from the centre. On the day all were treated to a luncheon with singing and dancing learners rounding of the beautiful day. Attendees were also treated to a song item by a choir from Naledi Primary School, with four learners, one of each school, also reciting poems, which appropriately had technology as a theme. All were very grateful to now have access to technology where before they had no working computers at the school. The Thobo Trust head office is situated in the Senwes Building in Klerksdorp, North West Province. The Trust drives the overarching CSI and SED strategy for Senwes, whilst partnering with Senwes’ subsidiaries and Joint Venture partners on specific initiatives or projects. The core focus areas of the Trust are education, enterprise development and employee wellness. The majority of the Trust’s beneficiaries are from previously disadvantaged South African communities and individuals. In education the Trust is focused on technology, ECD’s and vegetable gardens in schools.